Yealink SIP-T48G/T48S IP Phones | 8x8, Inc. 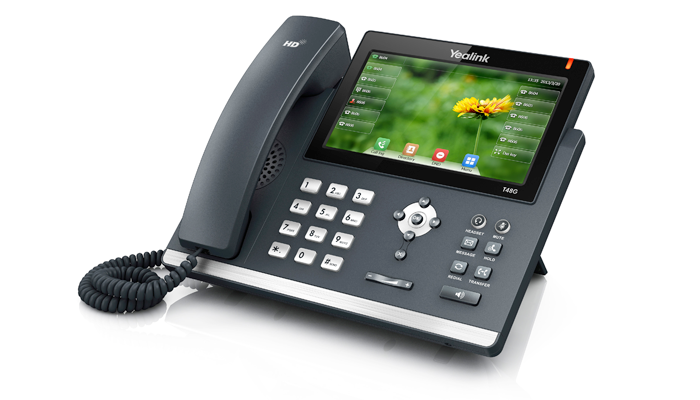 The Yealink SIP-T48G IP phone is a new class of IP desk phone with extraordinary technology innovation. The Yealink SIP-T48G is ideal for multitasking professionals, receptionists or group admins who require multi-call management with quick and responsive call handling. The T48G comes with a built-in Gigabit Ethernet bridge to connect a high speed device to your phone. Color touchscreen – Innovative interface is similar to a smartphone, just tap and swipe screen with your finger. 16 line keys – Use the standard 2 line keys for managing two live calls on your phone at the same time, and use the others as speed dial keys.